› Keep Your Cat Healthy › Parasite Prevention › What is a Parasite? There are two main types of parasites: external and internal. 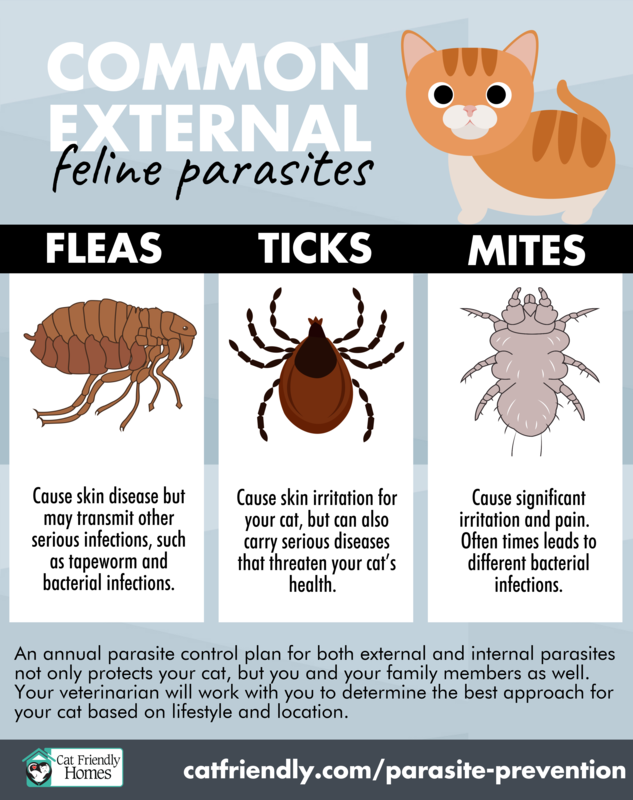 External parasites are those found on the hair and skin of cats. Internal parasites live in your cat’s internal organs, such as the intestinal tract or lungs. By definition, a parasite is an organism that lives on or in a host organism, and gets its food from or at the expense of the host. Do I Really Need to Know About Parasites? Fleas – found almost everywhere in the world. All cats are at risk of flea infestation, but those at highest risk include cats that have access to outdoors, cats living with other pets that go outdoors, and cats in multi-cat homes or environments. There are many flea control products on the market but not all are equally safe for cats, so your veterinarian should always be consulted before you apply a product. In particular, many products intended for dogs ARE NOT safe for cats as they can/may contain permethrin which is toxic to cats. Fleas cause skin disease, but they may transmit other serious infections, such as tapeworm and bacterial infections. Young kittens can become severely anemic from flea infestations. Ticks – vary in type and distribution depending on where you live. They can not only cause skin irritation for your cat, but can also carry serious diseases that threaten your cat’s health such as parasites that infect blood cells. Tick prevention products intended for dogs ARE NOT safe for cats. Mites – common parasites of cats, especially ear mites, which cause significant irritation and pain and can lead to bacterial infections. Other types of mites live on feline skin, such as mange mites, and cause hair loss, itchiness, and may lead to bacterial infection. Roundworm – common in kittens and young adult cats. 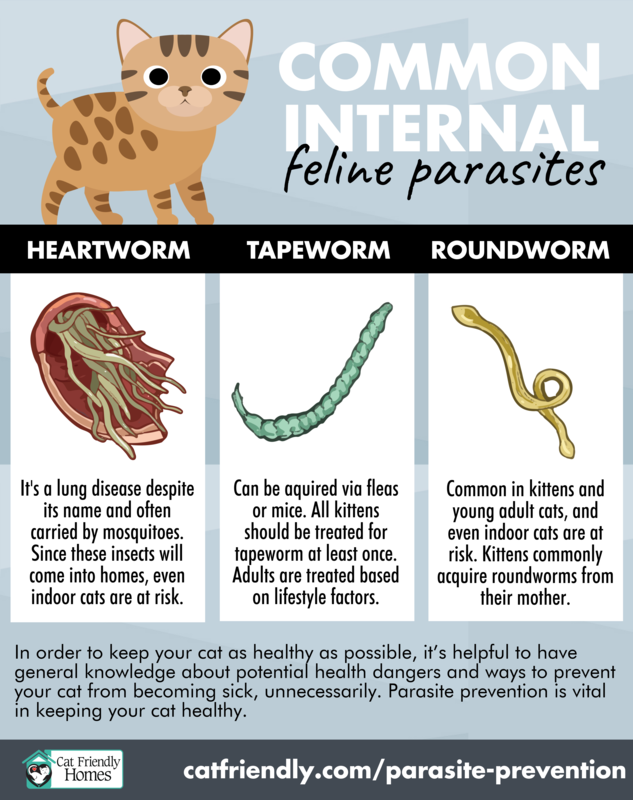 Cats can acquire roundworms via several routes, so even indoor cats are at risk. Kittens commonly acquire roundworms from their mother, so all kittens should be treated for this parasite. Tapeworm – can be acquired via fleas or when cats hunt and eat prey such as mice. All kittens should be treated for tapeworm at least once and adults are treated based on lifestyle factors. Heartworm – an important lung disease despite its name. The parasite is carried by mosquitoes and since these insects will come into homes, even indoor cats are at risk. Wherever canine heartworm infection is found, cats will become infected too, and should be on a regular preventive product.